The flexible control plane (FCP) installation is a process used for Proof of concepts (PoCs), evaluations and demonstrations. It is not intended to be used in production. It was developed to reduce the physical server count required for HOS 1.X from a minimum of 8 servers (excluding block storage) to 4 servers. 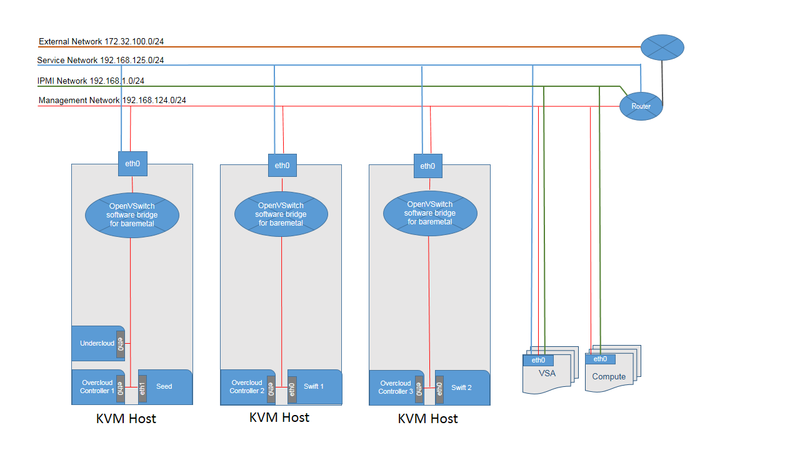 The same pre-requisites apply to the seed host and kvm hosts as apply to the standard seed host. Configure packages,NTP etc. Note: Field 1 is the BRIDGE_INTERFACE nic on the remote host. (If empty, this will default to the same value of BRIDGE_INTERFACE as used on the seed host) For example: “em59”. Best practise would dictate that you don’t enable root access for passwordless ssh but as this is only for an evaluation environment the root account was utilised. Identify the physical nic that will be used to bridge between VMs and the physical compute servers – for example see em1 in this post. Copy hp_ced_host_manager.sh to each remote hosts. Copy hp_ced_ensure_host_bridge.sh to each remote host. Once this has completed successfully copy the overcloud-config.json file to the newly created seed vm. Edit the baremetal.csv file and add the details of the two new compute nodes.